I've never been interested in what is essentially an Ocean's Extended Universe. I didn't like the original Rat-Pack Ocean's 11, and while I saw the remake I don't remember anything about it. I don't think I watched Ocean's 12 and I know I never saw Ocean's 13. Now we have Ocean's 8, which is where The Divas Strike Back. The all-female version of the Ocean's de facto franchise could have been good, but somehow by the third act it started dragging to where I lost interest. It wasn't terrible, but it lost its mojo and never quite got it back. Deborah Ocean (Sandra Bullock), sister of the perhaps-late Danny Ocean, is now out of prison after five years for fraud and theft. Debbie, in those five years, has had time to plan a master heist. Now all she needs is to round up a group to help her. First is her old running partner Lou (Cate Blanchett), now a club owner who is quick to join up. Together Lou and Deb get the others: hacker Nine-Ball (Rihanna), mistress of sleight of hand Constance (Awkawfina), fence Tammy (Sarah Paulson), diamond cutter Amita (Mindy Kaling) and eccentric fashion designer Rose Weil (Helena Bonham Carter). While all are important, Weil plays a major hand in that she is the only one with the cred to get the others connected to Daphne Kluger (Anne Hathaway), a vain actress who is hosting that year's Met Gala. The target is the Toussaint Necklace. This $150 million necklace is dripping with expensive diamonds and has been secreted away in the Cartier vaults for close to fifty years. Cartier has never loaned or even displayed the Toussaint Necklace, but due to Kluger's fame and her role as hostess of the prestigious Gala they agree to loan it out for just that one night. The plan is simple: steal the Toussaint at the Gala, then secretly replace it with Folgers crystals, or at least fakes. Each of our females plays an intricate role where everything must go like clockwork. Then comes the night of the Met Gala, and the plan is executed. 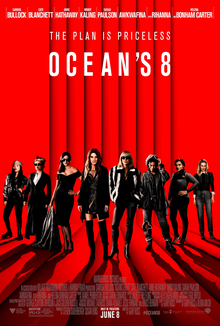 IF Ocean's 8 had ended where I thought it would/should end (the Cartier representative shocked to find the Toussaint was just a bunch of cheap cubic zirconium), I would have loved Ocean's 8 and even seen where a sequel could be set up. However, it didn't end there. Instead, we got a third act, and here is where the film went down for me. After the heist, in comes John Frazier (James Corden), the insurance agent set on investigating this crime. He quickly zeroes in on Debbie, having interacted with the Ocean family before. His job is made difficult by the fact that Debbie has an alibi: the Met Gala itself, where she was seen and photographed. No mention was made in his thorough investigation of the fact that she was passing herself off as German at the Gala, down to speaking nothing but German and pretending not to speak any English, but why quibble about details. Luckily for her, she has a ready frame-up job: her ex-lover, Claude Becker (Richard Armitage), who let her take the fall for crimes they had been committing. Now all signs point to him. It becomes Ocean's 8 because Kluger, far from being the dumb actress she was thought of, put everything together and wants to part of the group to, in her words, have friends. She even helps frame Becker for their crimes. There's one thing that does puzzle Kluger: how their haul is bigger than the Toussaint's total worth. Simple: the Toussaint Necklace, rather than being the main event, was just the preliminaries to the real heist of all the Crown Jewels on display at the Met. With that, the various women move on to great successes in their personal and professional lives, and Deborah Ocean goes to her brother's alleged crypt, has a cocktail and tells him how he'd love the heist. I'm not averse to having an all-female heist film. After all, I think the original The Women is a masterpiece. Ocean's 8 has been sold, in part, as a female empowerment film, showing that women are equal to men when it comes to committing larceny on film. Fine, I don't care one way or another. On two occasions is the gender made relevant: once when Debbie says "A 'he' gets noticed, a 'her' gets ignored" or words to that effect when she rejects hiring a man for the crew, and in a pep talk where Debbie talks about how out there there's a little girl dreaming of becoming a thief, so they should do it for her. No offense, but that line didn't get Hillary Clinton elected President, and it isn't going to get me to applaud Ocean's 8. Therein lies the difficulty: I enjoyed Ocean's 8 for the longest time. It was fluff, but entertaining fluff. I liked how we got this harebrained scheme rolling, even if whatever difficulties they encountered were dealt with virtually by hand-waving. I even enjoyed up to a point how we had our team concoct this wild scheme and managed to check all the multicultural boxes: all-female, two Asians (Kaling and Akwafina) and a black woman (Ri-Ri). So what if in all this they could not find a Hispanic. I should get used to idea that in Hollywood, there is no such thing as a Latino/Latina, unless they're the maids, janitors and kitchen crew like they are in Ocean's 8. It wasn't until we got past the heist that Ocean's 8 fell apart for me. In a strange sense, the film starting failing when they brought a man into the picture, and a bad one at that. James Corden is constantly pushed at me as some sort of comic but he's never been funny. His character is superfluous to the goings-on around him, and moreover, both the character and Corden just fail at everything they try. He is not funny. He is not menacing. He is not interesting. He is not bright. He just drags everything down. I'm supposed to believe he's had this longtime connection to the Ocean family, but why would I care? Again, I have to wonder how thorough his investigation is if in all the interviews he had, no one ever mentioned that Deborah Ocean was speaking German and pretending not to speak English. It does seem strange that Ocean's 8 went the route it did. It makes 'a woman scorned' a prime motivator for the main character. It makes said scorned woman an attachment to the overall Ocean's Universe rather than have be perhaps someone Danny mentored or even just someone who admired Danny Ocean's methods and decided to do them one better. The characters, sadly, are mostly paper thin. Again, it seems odd that for a film that expounds on female empowerment, we never got a real sense that these women liked each other, let alone liked working with each other. I figure Ocean's 8 passed the Bechdel Test, but at its heart is still Debbie enacting revenge on Claude, something Lou raises the most minor of objections to before that's forgotten. Apart from a few moments, such as Constance guiding Amita on the fine art of 'swiping left or right', we never saw them bond. It seems such a waste to have such a collection of talented performers, for the most part, and do little with them. As they are the big stars, the quartet of Bullock, Blanchett, Carter and Hathaway had the lion's share of work, and they were better than the material. Both Carter and Hathaway steal the film, the former for bringing real life to her wacky designer and the latter for essentially spoofing her public persona. I'm far too removed from celebrity/pop culture to know how many cameos there were or who made a cameo, but my last question regarding Ocean's 8 is this: is Katie Holmes really that big of a star to merit an invite to the Met Gala?